The urge and will to gain freedom against great odds and to enjoy the blessings of individual liberty is our Texas heritage. It was not long after Texas won her independence and became a republic that a group of pioneer Christians gathered under a live oak tree at the plantation home of Dr. Robert and Mary Trigg Peebles to discuss the organization of an Old School Presbyterian Church on the west side of the Guadalupe River Valley. This organizational meeting lasted three days with Rev. William Blair acting as moderator. On July 8, 1849, Elizabeth Smith Calhoun Barnhill, Miles Squire Bennet, Bathsheba Gibson Bennet, Mary Trigg Peebles, James Norman Smith, and Elizabeth Morehead Smith signed the covenant, elected two ruling elders, James Smith and Miles Bennet, and baptized three month old Samuel D. Bennet. 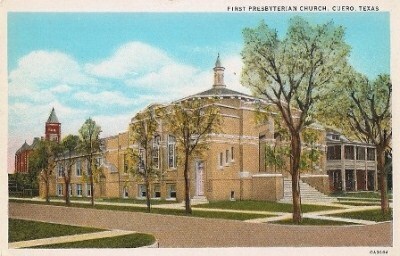 Because many of the services were held under the live oak tree, Mrs. Peebles suggested the name Live Oak Presbyterian Church. It became one of the seven charter churches in the Presbytery of Western Texas, organized in Victoria in April 1851. From July 1949 to August 1951 church services continued under the oak tree with sermons provided by Rev. William Blair, Rev. Steven Cocke, or Rev. James Wallis. After August 1851, the Live Oak Presbyterian Church was relocated to Clinton, Texas in the log frame courthouse. In 1980, the Live Oak congregation dedicated its own church building. On September 16, 1855, on the east bank of the Guadalupe River the Concrete Presbyterian Church was founded with 13 members of the Live Oak congregation. 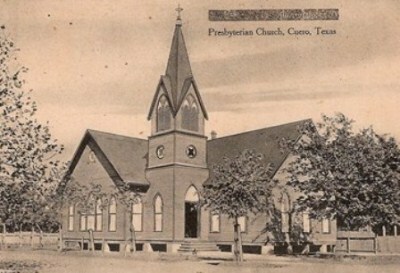 October 13, 1878 a Presbyterian Church U.S. was organized in Cuero and met the Episcopal Church once a month. Live Oak and Concrete petitioned the Presbytery of Western Texas to consolidate the three congregations into one church to be located in Cuero and called First Presbyterian Church of Cuero. This was approved and the union consummated on May 5, 1883 with a total of 166 members. Lumber from the Live Oak Church in Clinton was used to build a frame building in Cuero on the corner of Courthouse and what is now McLeod Street. After �the storm of 1886� blew down the structure, a larger building was erected with stained glass windows commemorating Pastor William Caldwell and James Norman Smith. The pipe organ was installed in 1903 and in 1916 a large brick structure was constructed with a basement and additional windows. Our current building was dedicated on March 28, 1971.